A tour of the monuments. I recently led a tour in Battery Park, at the southern end of Manhattan. We visited the well-known tourist realms, such as Castle Clinton, built in 1811 to defend against the threatening British on a man-made island in the Hudson River that has been landfilled into Manhattan; after serving as the USA’s first immigration center, predating the one on Ellis Island, an entertainment center and an aquarium, it now serves as a ticket vendor for various pleasure cruise lines in the NY harbor. We visited The Sphere, a sculpture once located in a plaza adjoining the original World trade center a few blocks north; and discussed things like the Peter Minuit “purchase” of Manhattan Island from the Lenape, which occurred not here, but far uptown in today’s Inwood Hill Park. My aim on the tour, though, was to point out the little-known monuments in the park. Over the past three years, Battery Park access has been limited, as the park was renovated in combination with underground repairs to the Hurricane Sandy damaged 2009 South Ferry station. A new, Central Park-style grand lawn has been installed for sunbathers, while the small monuments have been arrayed on the park’s adjoining State Street and Battery Place. This monument, at this writing, still had the bust of bewhiskered nautical engineer John Wolfe Ambrose (1838-1899) missing; the bust was originally located near the water’s edge, but a miscreant stole the bust in 1990. A recreation bust is on the way. Ambrose assisted in the engineering and construction of the 2nd and 6th Avenue Els (neither of which survived the 1940s), the pneumatic tubes for Western Union telegraph service. His claim to nautical fame comes from his presidency of the Brooklyn Wharf and Dry Dock Company. Recognizing the inadequacy of New York Harbor’s rocky and shallow seaways, Ambrose lobbied Congressional committees to authorize the funds to dredge the waterways and create deep water channels that would permit a deep and wide harbor channel, which was named the Ambrose Channel after his death. This monument was dedicated by Mayor LaGuardia in 1936; it has been shifted around the park and is missing its bust, but has been given a makeover with a new bust expected soon. 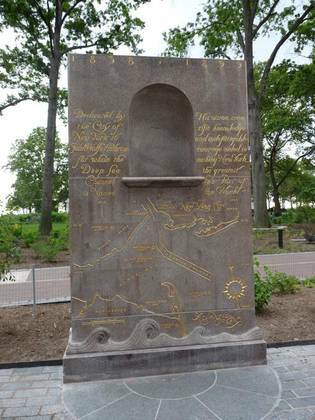 Another unusual monument honors wireless operators who were lost at sea before 1915. In this era of bouncing signals off satellites and whatever audio or video we want at our fingertips at any time of day, we sometimes forget that sending words and pictures through thin air via invisible radio waves was once unknown. Italian inventor Guglielmo Marconi ushered in a new age with his first “wireless” transmissions in Bologna in 1895. The transmission of wireless signals became a lifeline for commercial and military vessels at sea. 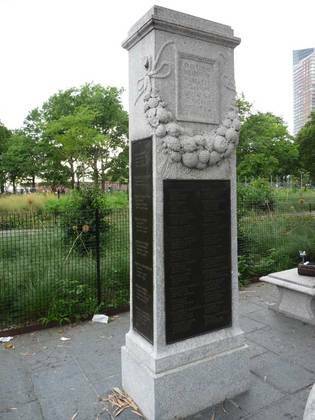 First among the wireless operators honored on this cenotaph are Jack Phillips, who was aboard the Titanic when it hit the North Atlantic iceberg April 15, 1912. This British cannon was salvaged from the corner of Broadway and Exchange Place during excavations in 1982. During British occupation of New York City from 1776-1782, Exchange Place was the pathway to British Hudson River fortifications known as “The Oyster Pasty” likely from its shape that resembled the empanada-like comestible that consisted of light pastry filled with meat, cheese, or vegetables; in New York, whose harbor was teeming with oysters, a variety made with the shellfish must have been popular. 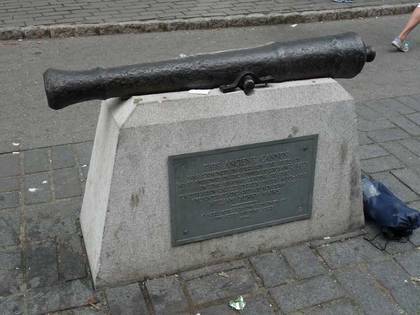 The cannon was it was placed in Battery Park with a plaque by William Henry Mairs and the City History Club in 1914. This subway station house serves the IRT 4 and 5 lines and was constructed by early subway architects Heins and LaFarge in 1905. 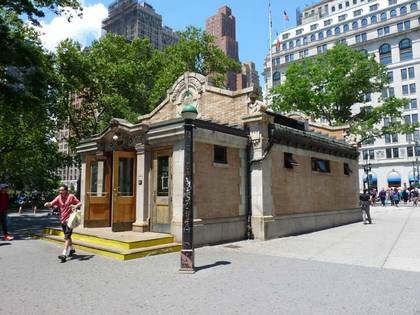 Other stationhouses include ones at 72nd Street and Amsterdam Avenue and at the Atlantic-Pacific station in downtown Brooklyn. For decades, these buildings were considered to be superfluous but too much trouble to take down, but renewed emphasis on city infrastructure, combined with a crime drop in the 1990s, made the city reconsider them and recultivate them. 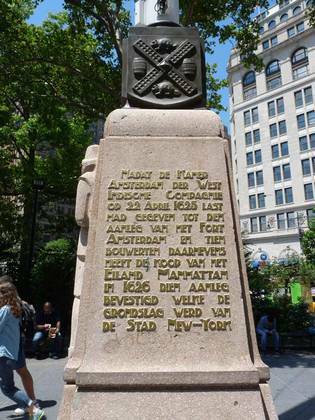 This flagpole at Battery Place and State Street, with gold-leafed inscriptions in English and Dutch, was a gift from the Netherlands to NYC in 1926, the 300th anniversary of the supposed purchase of the island by Peter Minuit from the Lenape in 1626. It was designed by H.A. van den Eijnde (1869-1939), a sculptor from Haarlem in the Netherlands. Originally it stood south of Castle Clinton, then the site of the New York Aquarium. In 1939 the monument underwent restoration and the inscriptions were recut. Subsequently, a fire caused damage to the monument. When the park was closed from 1940 to 1952 for renovations and to build the Brooklyn-Battery Tunnel, the monument was relocated to its present site at the northeast entrance. It was renovated to its present appearance in 2000. The Walloons were Protestants from what is now Belgium who had fled to Holland to escape religious oppression from the Catholic majority, but also faced the same trouble in the Netherlands from the Reformed populations. The solution, in the 17th Century, was to make a go of it in the New World and so, Jesse DeForest and a band of 32 Belgian Walloon, or Huguenot, families appealed first to the British to allow them transit to North America. Denied, they shipped out with the Dutch, arriving in May 1624. Even today, the Walloon and Dutch influence is noticeable in Staten Island street names along the north and west shore, where we find Walloon and Brabant Streets, as well as Huguenot Avenue. 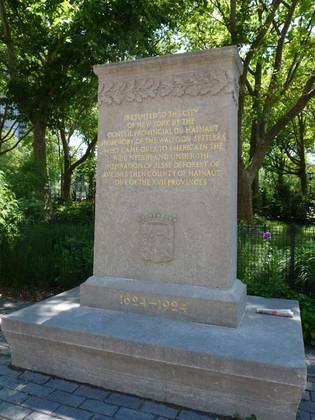 The monument to the Walloon Settlers, a 10-foot tall granite stele dedicated in 1924, was designed by Henry Bacon, who also designed the Lincoln Memorial in Washington—as well as NYC’s ubiquitous park lampposts. 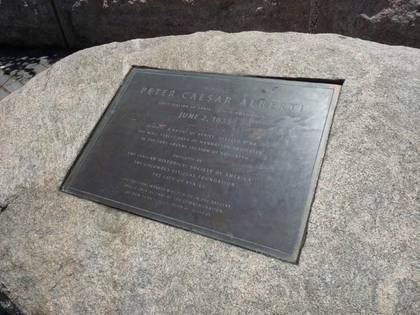 This monument, which replaced a smaller monument in Bowling Green, honors the first Italian immigrant to New Amsterdam, Pietro Caesare Alberti (1608-1655). At age 27, Alberti, a Venetian, decided to seek a new life in the New World after Venice was devastated by a bubonic plague outbreak. Once again, the Dutch provided passage as they had with the Walloons, and Alberti arrived in June 1635. He married a Dutchwoman, raising six children. The Albertis were granted 100 acres from the Dutch West India Company in 1646, but Pietro and his wife perished in an Indian raid in 1655. However, historians assert that everyone with the surname Alberti, or its variant spellings, can trace their ancestry to the couple. This monument was originally dedicated as a gift from the Italian American Historical Society in 1958 and was rebronzed in 1985.